Warren Clark sent a resume and cover letter to ISIS to teach English at a university in Mosul. 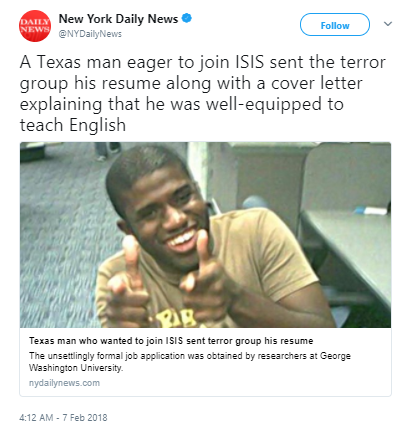 A Texas man wanting to join ISIS sent the terrorist organization his resume and cover letter explaining why he would be a good candidate to teach English. “I am looking to get a position teaching English to students in the Islamic State,” Warren Clark, 33, wrote in his cover letter, using the name Abu Muhammad al-Ameriki, the New York Daily News reported. Clark sent the cover letter applying for a position at a university in Mosul in northern Iraq. Mosul was held by ISIS until July 2017, when Iraq declared it had recaptured the city. Clark’s application for a position at the university was found in an Iraqi house and was obtained by researchers at George Washington University, who released a report on American jihadists in Syria and Iraq. “We had a source in Iraq whose neighborhood was taken over by ISIS fighters, and when it was taken back by Iraqi forces, there were documents left behind and that’s how we received the cover letter and resume,” said Seamus Hughes, deputy director of the program. A person who knew Clark in high school told NBC News that Clark converted to Islam in 2004 and was exposed to radical sites. According to that person, Clark made several anti-American social media posts. “ISIS are only fighting soldiers that have been oppressing Muslims for years. They are liberators,” he wrote in a 2014 post. Clark’s mother told NBC News that she was unaware her son applied to work for ISIS. According to the researchers, Clark worked as a substitute teacher in Texas before moving to Saudi Arabia to teach English. Clark was a University of Houston graduate. Clark is still believed to be alive. The report said that the FBI reported 300 Americans have attempted to leave the U.S. and join ISIS in Syria and Iraq. Of the 300, 64 Americans joined ISIS, but only 12 of them returned to the United States, of which nine were arrested.